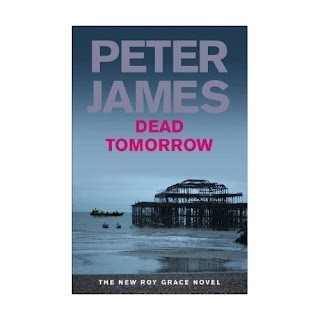 I’ve just finished reading Dead Tomorrow by Peter James. I was introduced to this guy when his then editor Steph Bierwerth handed over a copy of Dead Simple whilst I was visiting the Macmillan offices in London. That first book was one of those that leaves you out of breath by the time you finish it and I enjoyed it immensely. I passed it on to my father-in-law who also enjoyed it and has been buying subsequent books by him. Caroline has also been enjoying these ‘Dead’ books, the ‘Roy Grace Series’ but agreed with me that a couple of them seemed a little flat which, from other reading, I see can be a problem when a writer confines himself to one location and one set of characters. This is definitely not the case with Dead Tomorrow. There were no moments of ‘get on with it’ as James racked up the tension and kept me focused all the way through. The story, concerning organ trafficking and viewed from every angle – from the unwilling donors, the recipients and from the police, had an ugly fascination. A reminder that we are actually entering the kind of world hinted at in some SF books (Larry Niven’s Organleggers spring to mind). Recommended. Later I’ll be taking a look at a book I’ve been looking forwards to, and which Macmillan have just sent: Nova War by Gary Gibson. Bugger, despite my promise I've failed to write in here as often as I should. I have failed, for example, to mention the Guardian article in which I'm included as one of the 'New British Space Opera' crowd with a great line in tennis playing cyber monkeys (I forget the exact wording). So what's impelled me to write in here now? For the first time with any of my books I'm in an Amazon number one spot -- new releases/science fiction. Every damned time before I've been in second place to Banks, Pratchet (who shouldn't be in SF) or some Dr Who tie-in. This time Orbus has done it for me, so celebration time!